In 1986, Dr. Lowell F. Clark left chilly Minnesota for the warmth of Florida, where he founded The Clark Clinic and has dedicated himself to meeting the needs of rural and underserved residents. He recognizes that a key to providing quality care in rural areas is taking advantage of emerging technologies, including telemedicine. 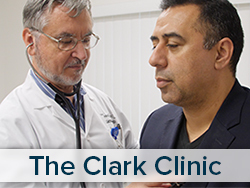 After evaluating many providers, leadership and staff at The Clark Clinic concluded that eClinicalWorks — their healthcare IT partner since 2012 — offered a telemedicine solution best suited to their needs. Implementation and training on healow TeleVisits followed, including a “Tech It Up at The Clark Clinic” campaign early in 2018. The Clark Clinic uses healow Open Access® for appointment booking, Messenger campaigns for Patient Engagement, and healow TeleVisits for telemedicine. Care is available at clinics in Bushnell, Mascotte, and Howey-in-the-Hills — as well as skilled nursing facilities. The results have included improved access to services, more efficient workflows, and better outcomes. Founded in 1986 to better serve residents in rural areas of Florida, The Clark Clinic’s two dozen providers now serve thousands of patients at three clinics northwest of Orlando, as well as skilled nursing facilities in the area. They focus on wellness and prevention and specialize in geriatrics and the treatment of chronic disease. In order to better serve patients for whom getting to a clinic can be difficult, they now offer healow TeleVisits for online medical visits, as well as healow Open Access® booking to meet their patients’ needs better.